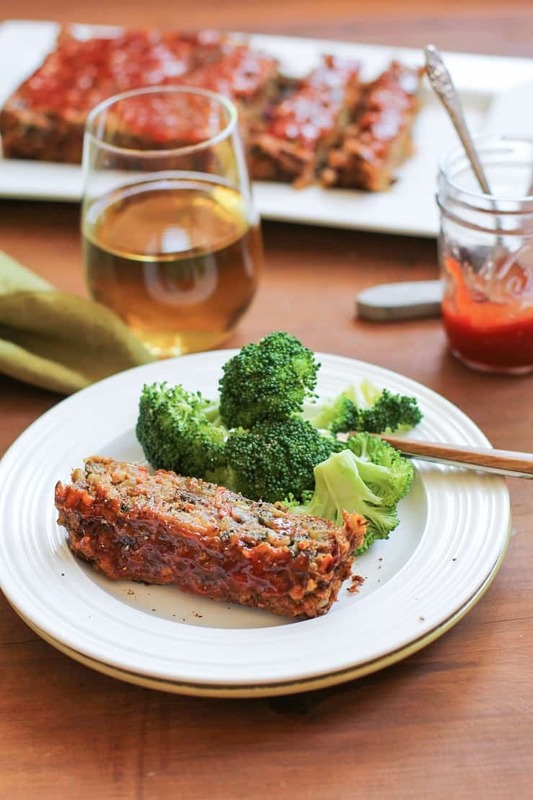 Curry-Ginger Lentil Vegan “Meatloaf.” This gluten-free meatless entree gives the real deal a run for its money! Fauxloaf like you’ve never fauxloafed before! Ready or not, Thanksgiving is straight up at your front door. And guess who’s knocking? Every single dietary restriction known to man, and you must be prepared! If your holiday feast is fixing to look anything like mine, you’ll need to cater to gluten-free, dairy-free, refined sugar-free, paleo, vegetarian, and/or vegan guests. <- Don’t panic, this is what the boozes are for. I wish we could hold hands through the holidays and remind each other ITWILLALLBEOKAY. The crazy relatives, the smattering of restricted menus we must consider when hosting (or participating in) a feast. Not to mention all the extra gym time to follow the four slices of all the pies, the imminent detox, and the apologies required for things said while detoxing. What I’m getting at here is even if, like me, you’re amped to go into a massive turkey tryptophan coma on Thanksgiving, in all probability, there will be a vegetarian or vegan under your roof. No need to back away. This loaf is here to help..
…and holy moly, it will vegan a meat eater make. For those of you who are vegetarian//vegan//are planning a holiday menu for veg friends//simply enjoy a plant-based meal from time to time, here is your comforting, filling, flavor-infused, nutrient-packed hunk of non-meat lentil loaf. It’s loaded with vegetables, including celery, carrot, mushrooms, and spinach, along with your legume vitamin – the lentil, and your grain vitamin – the brown rice. Not to mention, we flavor blast the crap out of this thing by adding fresh ginger, curry powder, nutritional yeast (<- don’t skip it, folks! ), onion and garlic. Fellow meat eaters: I know you’re rolling your eyes right now – I did too the first time I heard of fauxloaf – but I double dog dare you to make this nonetheless. Basically, you’ll forget there’s no meat in it. Hell, you may even forget meat exists. You’ll eat thirds and fourths. Hell, you may even eat the whole loaf…but don’t do that, because: fiber. Don’t let the uuuuuuuge list of ingredients scare you! You likely already have most of the ingredients on-hand, and the recipe itself is not difficult to prepare – just a tad time-consuming. But like most things that require diligence and patience, the payoff is pretty tastic. Also, have you heard? There’s an apricot glaze on this thing and it is the tiiiiiiiits! If you don’t have apricot preserves on hand, you can use fig preserves, marmalade, or even raspberry jam. Please don’t skip the glaze, whatevers you do. It’s like the hot fudge to your sundae. You have my permission to eat this with a side of bacon. Or broccoli. Whatever’s your jam. Add the cooked brown rice, cooked lentils, tomato sauce, balsamic vinegar, flour, nutritional yeast, raw pecans, and dried cranberries to a large mixing bowl and stir to combine. In a small mixing bowl, whisk together the ground flax seed with the water. Allow it to sit for 15 minutes, stirring occasionally. This mixture will thicken substantially and will have an egg-like consistency after it sits. Meanwhile, in a large skillet, add the olive oil and heat to medium-high. Add the chopped onion and celery and saute, stirring occasionally, until onion is translucent and celery has softened, about 8 minutes. Add the grated carrot, chopped mushrooms, garlic, grated ginger, curry powder, cayenne, and sea salt. Continue cooking, stirring occasionally, about 3 to 5 minutes. Add the baby spinach and cook, stirring occasionally, until wilted, about 3 to 5 minutes. Remove the sauteed vegetables from the heat and allow them to cool for 5 minutes. Pour the flax “egg” mixture into the mixing bowl with the rice/lentil mixture and stir well. Also transfer the sauteed vegetables to the mixing bowl (Note: at this point, all of the ingredients for the “meatloaf” will be in the mixing bowl). Stir everything together until well-combined. Transfer the “meatloaf” mixture to the prepared loaf pan and pat it down into an even layer. Place on the center rack of the oven and bake for 40 to 50 minutes, or until loaf has firmed up in the center and is golden-brown around the edges. Allow loaf to cool 20 minutes. 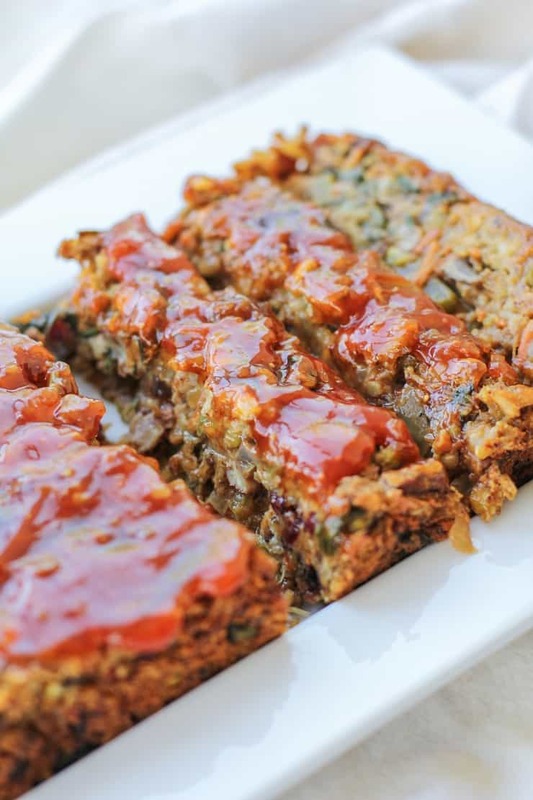 While “meatloaf” is cooling, whisk together the ketchup and apricot preserves for the glaze. Turn the loaf out onto a cutting board, then spread the glaze over the top. Cut thick slices and serve. Don’t do that because fiber–um, yes. Ha! Surprisingly enough my family doesn’t have any vegetarians/vegas (weird, right? ), but nonetheless this loaf looks perfect. I should probably hop on the faux loaf train because FIBER. Love it. Looks like a winner.. 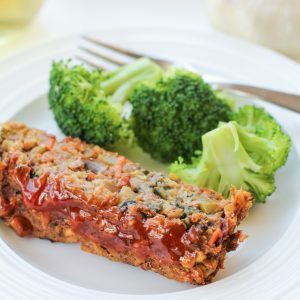 I have a question… on my meat meatloaf many times I plop it from being pressed in it’s mixing bowl onto my pellet grill/smoker… Do you think this lentil loaf would hold together well enough to do this as well? Hi Jeannie – I don’t think that would work with this recipe – it’d probably make a mess and fall through the cracks, because it’s pretty moist 🙂 Let me know if you try the recipe! Oh you have me laughing until my belly hurts. The Holidays = totally what the boozes are for. Oh my gosh, yes. Bring me more boozes! I’ve never made a vegan loaf before, and now I’m super intrigued. Looks amazing! I don’t have to worry about any dietary restrictions about my table this year, but this may have to happen anyway! This looks so good! I will have to keep this recipe in mind for my vegan brother. This looks a million times better than a tofurkey. 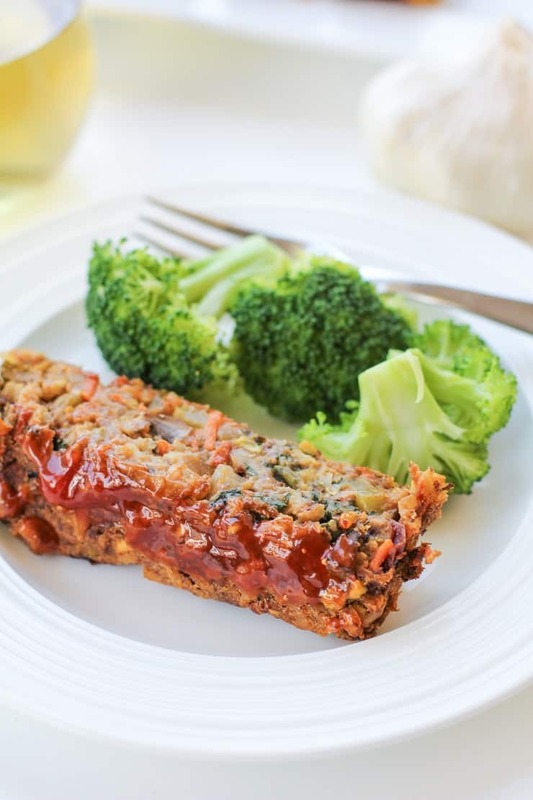 I love trying different veggie meatloafs like this! That apricot glaze sounds awesomeeee. Hope you’re having a great weekend!! Holy lolz to the dietary restrictions knocking at the door. Like haiiii I don’t eat turkey but I’ll eat anything involving hummus or stuffing or pumpkin….but wait. I die that there’s ketchup in this glaze! It’s SO essential!!! Nomtastical. Hello – I was wondering if this freezes well? Unfortunately, I’ve never tried freezing the “meatloaf” myself, so I’m not entirely sure…my guess is it would be just fine, since it’s such a hearty loaf. I’d just wrap it really well in plastic wrap and put it in a zip lock bag. I’d also thaw it at room temperature or in the refrigerator, rather than thawing it in the microwave 😉 Let me know how it works out! Where can I find the nutritional content for this meal? I would like to enter it in my food tracker, but there is not an option on this website….that I can see to obtain nutritional information, i.e. fat grams, protein, etc. Made this last night for dinner. It’s a lot of work but well worth the results. I made two alterations: regular flour instead of gluten free & regular pecans instead of raw. It turned out well & looked like the picture. Hi Julia! Thank you for so many amazing recipes! (Including this one.) I’ve made this a few times now and love it so much that I offered to bring it to my husbands family Easter for the vegetarians in the family. Though, since I won’t have time to make it immediately before the get-together I am wondering if you think it will be alright for me to make it the night before or the morning of and just put it in the fridge until it’s time to put it int he oven? Let me know what you think!